This is a free event with museum admission. No registration is required. Museum admission is free for Illinois residents every Thursday 5:00–8:00 PM —including during this event. 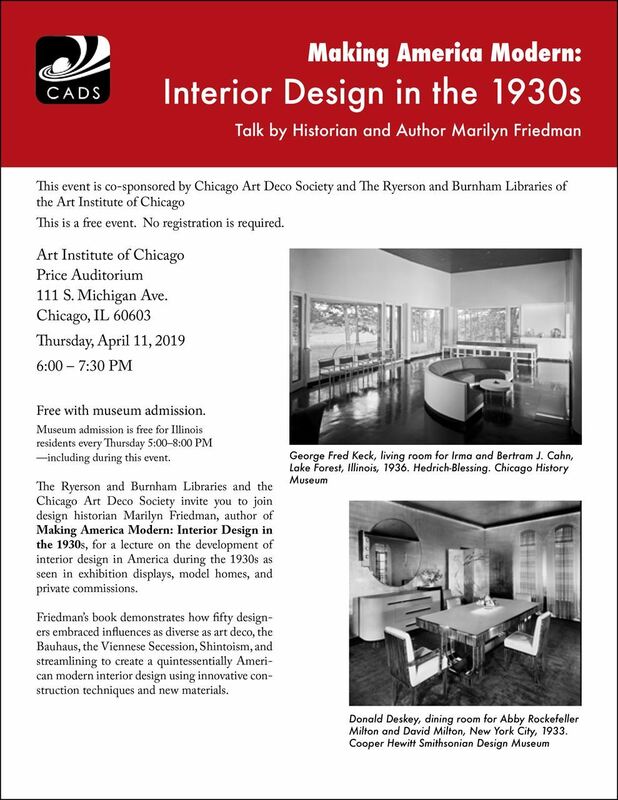 The Ryerson and Burnham Libraries and the Chicago Art Deco Society invite you to join design historian Marilyn Friedman, author of Making America Modern: Interior Design in the 1930s, for a lecture on the development of interior design in America during the 1930s as seen in exhibition displays, model homes, and private commissions. Friedman’s book demonstrates how fifty designers embraced influences as diverse as art deco, the Bauhaus, the Viennese Secession, Shintoism, and streamlining to create a quintessentially American modern interior design using innovative construction techniques and new materials.